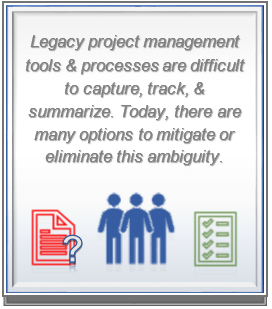 Is your Project Management Office (PMO) looking for efficiency and transparency? Then consider Dassault Systèmes 3DEXPERIENCE Project Management, Collaboration & Approvals & Traceable Requirements Management Apps. Whether your company is classified as a small, medium, or a large global enterprise, Razorleaf’s Consulting Services can help define your company’s data management priorities and program management strategy. How can these pain points be mitigated? The transformation begins with the following three easy steps. It’s still common today to have several documents of various versions within MS Word & Excel files. At any time, project team members can have duplicate versions of important documents “checked out”, resulting in downstream data inaccuracies for even the most vigilant Project Manager. It’s unlikely that Word & Excel files will be eradicated completely, even as more modern project management tools are deployed for your PMO organization. However, Dassault Systèmes Traceable Requirements Management (TRM) application helps centralize these documents with ease. The app includes capture functionality from Word & Excel. Not only can the text or spreadsheet data be captured, maintaining its original format, but pictures, tables, and graphs can be embedded as well! After the requirements are captured, editing and refinement of revisions continue to be made seamlessly. This functionality is leveraged by the “Rich Text Editor” which utilities “XHMTL” to add or remove text, images, and tables in real-time with peace of mind that autosaving provides. Lastly, if requirements need to be shared externally (outside the app), TRM will export changes into a MS document, including hyperlinks back to the “single source or truth”. Now that the requirements have been added into the app, the project team becomes involved throughout the rest of the project with full transparency into the data, priority, status, and responsibility ownership of the next steps. TRM has one primary dashboard to initiate these activities. Here it can decompose requirements into more granular types and categories, for example sub, derived, functional, & non-functional combinations. As more information is added, data clarification and accuracy are greatly increased when compared to more traditional project management methods. Moreover, the information is traceable to other types of requirements, test cases, and the percentage of completion of test plans and procedures. Requirement lifecycle relationships are instantly accessible to project team members; reports never have to be generated. The users can quickly observe if requirements are in progress, approved, released, or mapped to test cases. Lastly, requirements can also be associated and allocated to Logical & Physical Features which define different configurations to the actual product development variations. No matter the size of your Company’s organization or its product development complexity, the 3DEXPERIENCE Platform provides several applications which allow project team members access to critical data throughout its lifecycle in one location and with a common user interface across the platform. Combining the Project Management and Collaboration & Approvals applications, project leaders can consolidate many of the typical tasks throughout project phases. Primarily these apps provide the transparency needed to track the status of tasks, risks, impacts, decisions, approval routes, and schedules, all which correlate to requirements definition. For organizations with a mature CAD data management pipeline, the three apps covered in this article are complemented with Variant Management, Engineering BOM & Change Management, and CATIA Functional & Logical applications so Product Managers can maximize the capabilities needed to execute [Model Based] Systems Engineering, but that’s topic for several other articles! In closing, whether it’s time for your PMO to make an evolutionary or revolutionary transformation, Razorleaf can guide your organization through those needs from initial planning through implementation and support operations. Take the first step today and begin with Dassault’s Traceable Requirements Management application.